Is the universe infinite or just really big? With this question, cosmologist Janna Levin not only announces the central theme of her intriguing and controversial book, but proves herself to be one of the most direct and unorthodox voices in contemporary science. Even as she sets out to determine how big “really big” may be, Levin gives us an intimate look at the day-to-day life of a globe-trotting physicist, complete with jet lag and romantic disturbances. Nimbly synthesizing geometry, topology, and chaos and string theories, Levin shows how the pattern of hot and cold spots left over from the Big Bang may one day reveal the size and shape of the cosmos. 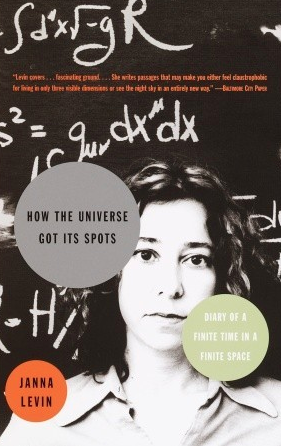 She does so with such originality, lucidity—and even poetry—that How the Universe Got Its Spots becomes a thrilling and deeply personal communication between a scientist and the lay reader.